We had a great first annual festival, in 2017, which emphasized on promoting health equity, employment and educational opportunities, community awareness (including health and related determinants, and the notion of empowerment). Getting Pan Africans and those working on their behalf to involve them to pursue policy changes that shift the social and other determinants of health, and related concerns as well as to provide the necessary space to talk about and fight for social justice. 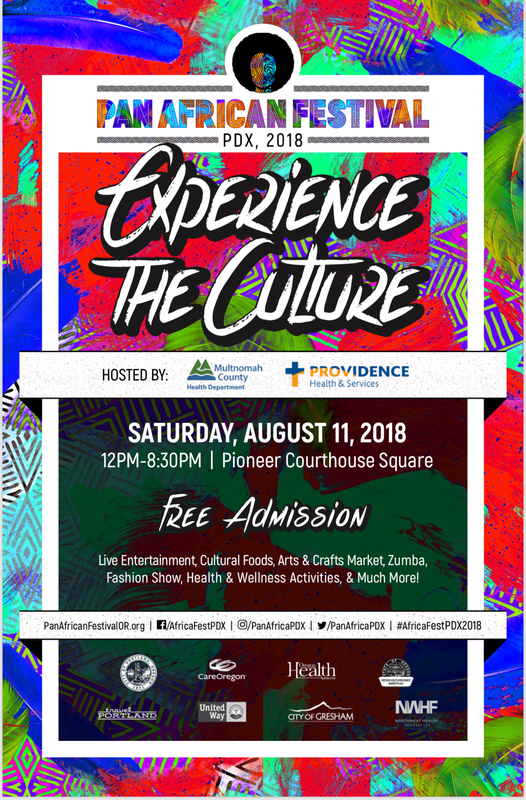 In 2018, the festival will bring over 5,000 Pan Africans and supporters in Oregon to Portland’s Pioneer Courthouse Square for a day to enjoy live music, dance, food and entertainment, health education, education and career awareness, financial literacy, and relevant other opportunities for people to get involved and take action to solve problems in their community. This builds on the adage that those closest to the problem are also closest to the solution. But, we need your help to accomplish this, to bring African people together to celebrate and connect with their new Oregon home, and at the same time reconnect with their roots. Ultimately the goal is to propel concerned individuals to participate in system, policy and environmental changes that improve and advance Pan African health and wellbeing. For sponsorship opportunities: contact Tricia Tillman at latricia.tillman70@gmail.com Click here to learn more about sponsorship opportunities. For volunteer opportunities: Contact Laus Mwakalebela at 503-841-0359 and Click here to join our volunteer list. Pan African Festival thanks the following Platinum and Host sponsors for the 2018 Pan African Festival.